The seasonal shift always brings with it certain cravings. Suddenly I find myself lusting after oddly twirling warty squashes in pastel blue and green. I've been unreasonable attracted to all things knit. If it's sweater texture, I want. My nesting vibes are at an all time high. I keep finding myself following interior design bloggers (this one! and this one!) ...drooling over oversized mirrors and taupe color schemes and quirky statuary. The minimalist in me is like only buy stuff you love and the crazy in me is like you only live once buy all the things! I compromise by thrifting. I just found a pretty dope white cotton knit throw which is currently the place holder for the new sofa cover I desperately need. My sofa cover was white, once. Long ago. It was a different lifetime, practically. I bought it with high hopes of being the sort of person who can own white furniture. But when you eat most of your meals on the sofa... eggs, avocado and pasta sauce inevitably end up splooshed around. It was a doomed venture from the start. Which reminds me, I really need to get a real kitchen table! Anyhoo, sipping a vegan chai latte mid-day is quickly becoming part of my fall routine. That cinnamon / cardamom / black pepper combo just gets me. It's peps me right back up in the afternoon. I call 3pm - 5pm my "creative doldrums." I rarely get anything creatively productive done during that time (I'm best in the morning and the evening). I can generally kick myself back into gear with a short meditation and a bit of stretching. But sometimes I just need to take a break and make myself a quick treat to make my brain function. 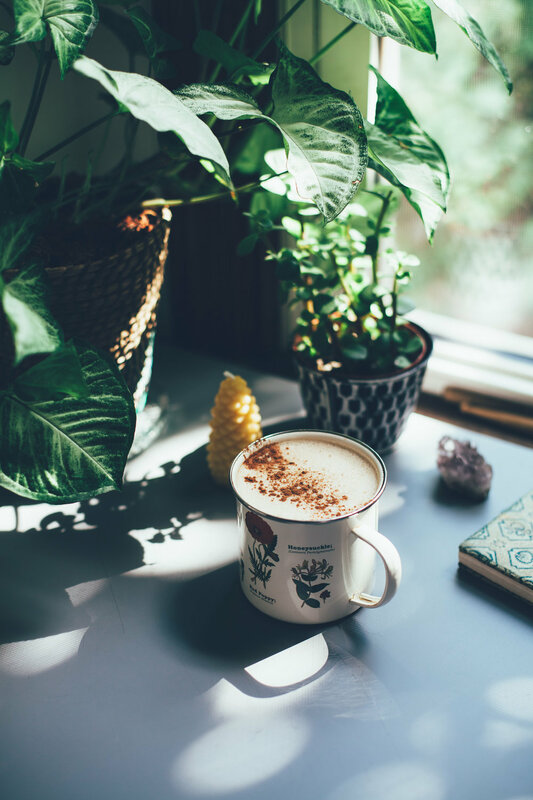 As much as I love drinking masala chai plain, brewed strong or with a touch of raw honey, there's something particularly wonderful about a frothy blended vegan chai latte. It's that magical combination of froth, spice, heat, sweet and fat. Fats just make my whole nervous system go "aaaaah" (as in a sigh, not a scream). 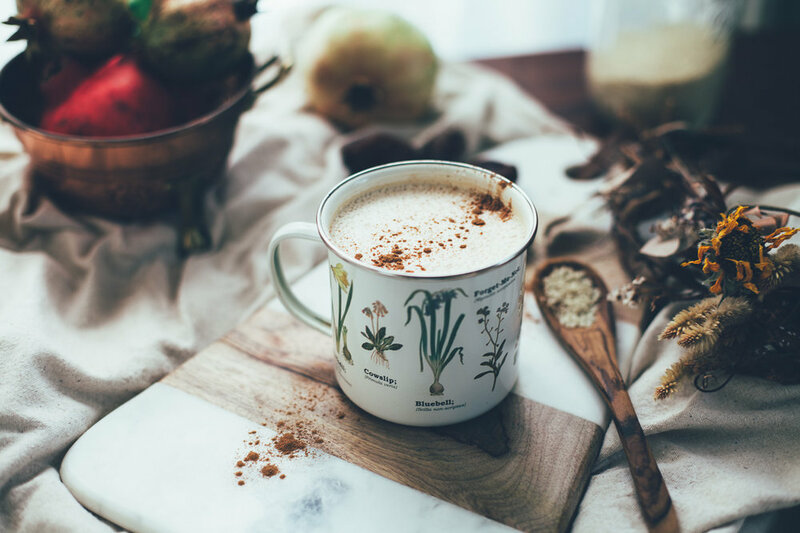 Meet the date-sweetened vegan chai latte with tahini! Basically this moment in drink form (cue warmly giggling rotund indian dudes in orange turbans). It's a heart-warming combination of sesame tahini + almond butter + dates + spicy chai. When you blend it all together, you get a wonderfully thick, luscious latte with that classic cap of foam on top. It's simple, creamy, warm and spicy. Tahini adds a subtle earthiness that rounds it all out, making this chai latte surprisingly complex for such an easy treat! For the masala chai loose leaf tea, I used this blend from Rishi. Any spicy, traditional-style masala chai blend works. Just make sure it's brewed nice and strong or the chai flavors won't stand out against the nut and seed butters. Last thing: Notice a difference between some of these photos? I took the warm, taupe shots against an East facing window. I took the cooler, more dappled shots against a South West facing window. Both were shot around 1 pm on a semi-overcast day. Both are backlit. And the mood is so different! Mega cozy vs. California clean. It's amazing what moving your subject can do to the emotional quality of a photograph! Note: for this latte I prefer a really strong, classic masala chai flavor. Use a loose leaf blend made of black tea, cinnamon, cardamom, ginger root, black pepper and cloves. Rishi Tea’s loose leaf masala chai is the brand I’m currently using. Brew the chai very strong. I often will add my masala chai to my cold water in a pot and bring to a simmer very slowly to brew it strong. It takes about five minutes. I've also made this simply by pouring hot (not boiling) water over the loose leaf tea in a tea strainer, brewing for about two minutes so as to avoid over-steeping the black tea. Strain the tea leaves out of your hot tea. To a blender cup, add the hot tea, almond butter, tahini and dates. Blend on high until the drink gets frothy and the dates are emulsified. My blender does this in about 15-20 seconds.